This lovely watercolor by the German artist Hans Unger around 1918-20 represents a sunset on the island of Sylt, in northern Germany. The composition is mostly focused on the sky, where the yellow rays of sun are decomposed in blue and green touches, with an almost goldish aura. The sea and the sky are only separated by purple lavish and three boats sailing on the horizon. The focus on light and its representation appear as a constant in Hans Unger’s production, starting with his beginnings in Dresden Academy of Fine Arts in 1893, under the direction of Friedrich Preller the Younger and Hermann Prell. At the same period, he was also part of the Goppelner circle (Verein bildender Künstler Dresdens), a group of painters reunited around Carl Bantzer and Gotthardt Kuehl, who turned their backs on classical tradition to work outside, in Goppeln, in the south of Dresden, following the impressionist manner. Hans Unger’s artistic production is mostly known through his works representing nudes or idealistic women in surreal landscapes, such as Die Muse (1897, Staatliche Kunstsammlunger Dresden), a beautiful harpist in front of a raging sea under a dark purple sky. This interest can also be also found in Unger’s designs for advertising posters (Estley-Orgeln, 1896, Kunstsammlungen Chemnitz) and mosaics (Lichtgötting, 1912, Ernemann factory, Dresden). Along these pictures of feminine fugures, some wonderful landscapes can be seen in museum’s collections, mostly in his hometown, in the Bautzen Stadtmuseum, where a room was already devoted to him in 1912. 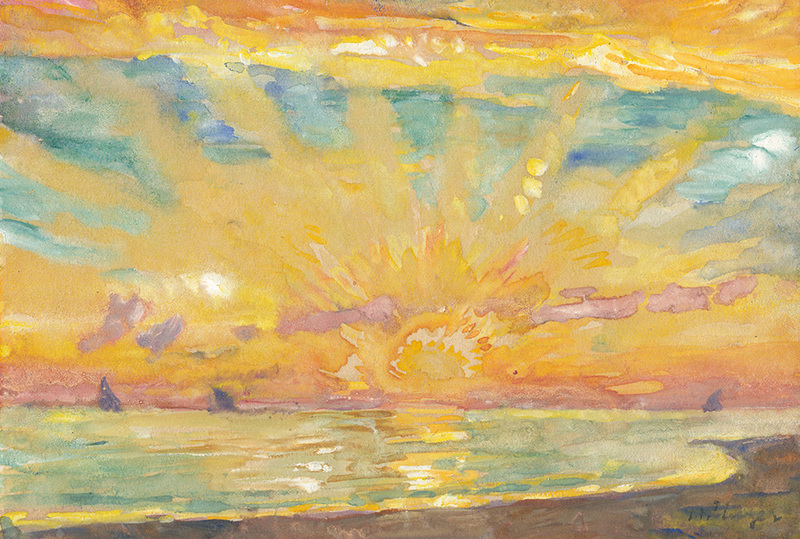 The museum holds a wonderful Triptych, Sommertag am Meer (1906) and a landscape with a sunset, Sonnenuntergang (1920), whose subject and manner are very similar to this sheet and is known to have been made on the island of Sylt, which Hans Unger started frequenting with his wife from 1909. It’s an oil on canvas (50 x 61 cm) representing a sunset seen from the coast, with the same colorful expression, and a very similar treatment of the rays of sun, with long and divided touches. This painting and our sheet might have been created around the same period, and maybe even at the same place.